The Steelers need for a quality backup QB may have just gotten more interesting, as there’s another name on the market the team is being linked to – that being former Browns and Texans quarterback Brian Hoyer. Hoyer was released by the Texans on Sunday, this after going 5-4 as a starter in nine games last season. He was awful during the teams’ wild card playoff loss to the Chiefs, throwing four picks as the Texans at home were shutout 30-0. The Steelers know all about Hoyer, as they played him twice two seasons ago when he was the starter in Cleveland, beating him and the Browns opening day 30-27, but then in week six Hoyer threw for 217 yards and a score in a 31-10 win in Cleveland. For Houston last season he threw 19 touchdowns, seven interceptions, and 2606 yards. 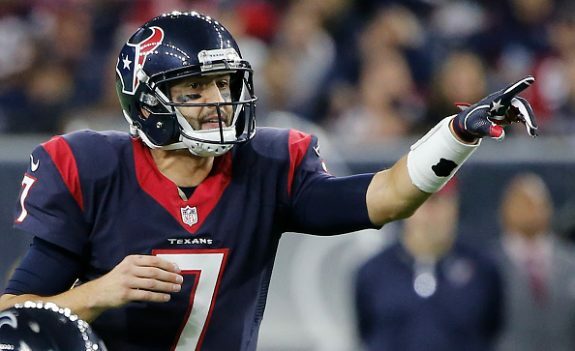 14 Comments on "Could the Steelers Take a Flier on Former Texans QB Brian Hoyer?" I watched the Texans wild card playoff loss to the Chiefs and Hoyer played one of the worst games I have ever seen a quarterback play . He was simply awful . That being said , if he was brought in strictly as a backup , he would probably be an upgrade over Landry Jones . However , make no mistake , this guy is not a starter and should not be considered one . Guess some forgot Hoyer played for the Steelers in 2012 and they have always had an interest in him as a backup. Suppose Cardale Jones falls to the Steelers in Round 2, DaveB. Do we take him? It would be a very interesting scenario and one I would have to think hard on , but with all the needs the Steelers have on defense , it would be hard to pull the trigger on Cardale Jones . The Steelers need more help than just corner . They need safety help and depth on the defensive line as well . Since we both favor fixing the defense first, I rather expected that would be your response — and I agree. But if C. Jones is available when we exercise the pick, imagine the apoplexy in the Steelers’ draft room. Tomlin couldn’t resist reaching for Mike Adams a few years back, and this one would be even tougher for him to resist. Steelers Nation is brighter than you think dudette. Cam Newton just went to the Super Bowl . Russell Wilson won it 2 years ago and Doug Williams was one of the best black quarterbacks in league history with a Super Bowl win . I could care less if hes black , white , pink or albino . If hes good enough to get my team to the big game thats all you can ask for . There are white quarterbacks currently enshrined in the HALL OF FAME who never won a super bowl . Fran Tarkenton and Jim Kelly just to name a few . Dynasties are great but they dont come along that often . Nice try, my friend. Unfortunately, bigots are rarely amenable to logic. DaveBn, I can name you 50 black QBS that have failed miserably as they do NOT transfer the talent to the NFL. Russell Wilson is half and half and anyone can find a nut once in awhile. BTW,Does Donovan McNabb ring a bell?